Lymphedema should not be confused with edema arising from venous insufficiency, veinsthat cannot pump enough blood back to heart. However, untreated venous insufficiency can progress into a combined venous/lymphatic disorder which is treated the same way as lymphedema. Edema is defined as an accumulation of an excessive amount of watery fluid in the soft tissues of the leg including skin, fat and muscles. Edema will occur when there is inadequate pumping of the blood by the veins (venous insufficiency). The resulting increased back-pressure in the veins forces fluid to stay in the extremities(especially the ankles and feet). It generally occurs in the lowest part of the leg, as a result of gravity. Lymphedema is a condition where there is an obstruction in the lymphatic system of either the lymph nodes or small lymphatic vessels. This blockage may occur from lymph node dissection, infections, trauma or congenital absence in lymphatic pathways. Lymphatic fluid is protein rich providing a culture medium to host bacteria leading to infection. When the fluid is allowed to accumulate, swelling will increase in the soft tissues, causing it to harden and lead to fibrosis of the tissue. Signs/Symptom: Over 4 million people in the United States suffer from lower extremity edema. Typical complaints can include heaviness, tightness, dull aches, tingling, numbness and skin discoloration of the leg or foot. Patients tend to complain that their legs swell more toward the end of the day, or after they have been standing for a prolonged period of time. The swelling improves overnight if the legs are kept elevated. Treatment of lower extremity edema begins with identifying the underlying condition. 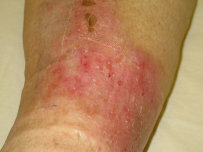 Edema can be caused by systemic diseases of the various organ systems of the body: (heart, liver, kidney and lungs being the most common).The more common peripheral causes are: venous insufficiency and varicose veins, primary/secondary lymphedema and a more dangerous cause blood clots (deep vein thrombosis). Complex decongestive therapy (CDT) is and effective treatment for lymphedema and can be used as an adjunct in the treatment of peripheral vascular conditions. A study published in the Archives of Medical Science explored the use of CDT (manual lymphatic drainage, compression bandaging, specific exercises and skin care) prior to vascular surgery, Manual lymphatic drainage improves the quality of life in patients with chronic venous disease: a randomized trial, July 7, 2011. The study concluded, Manual lymphatic drainage decreases the degree of disease severity and foot/lower limb volume in patients with chronic venous disease, as well as improving their quality of life. Manual lymphatic drainage applied in patients with chronic venous disease pre-operatively provides better outcomes of treatment. This was manifested by a decrease in the degree of disease severity, lower limb volume and improvement in quality of life. Different treatment options are available for LE edema and they will depend upon the cause/extent of the swelling. Options can include diuretics, manual lymphatic drainage with compression bandaging, surgery and fitted compression garments. Please consult with a physician to find out which options are best for your particular situation. Lymphedema therapy reduces and controls the amount of swelling in the affected limb, as well as restoring its function. The objective of this method is to redirect and enhance the flow of lymph through unharmed cutaneous lymphatics. Initial gentle massage technique or the (Vodder Method) is intended to redirect lymph and edema fluid towards adjacent functioning lymph nodes. Compression therapy with bandaging and compression garments. In order to enhance lymphatic flow from peripheral to central drainage components, exercises are aimed at augmenting muscular contraction, enhancing joint mobility, strengthening the limb and reducing the muscle atrophy that frequently occurs secondary to lymphedema. The patient maintains and optimizes the results by applying the techniques learned as well as by wearing a garment/sleeve during the day or bandaging the affected limb overnight and exercising for 15 minutes per day while wearing the bandages. This is continued until swelling resolves. These illustrations below shows different areas of the body being affected by Lymphedema and some of the reactions.